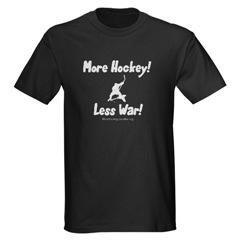 More Hockey Less War » The Shop is Back! I finally got off my booty and got the merchandise sorted out and put back online. I’ve reorganized it so that each design has its own Cafe Press shop, and you can choose from many styles for any given design. I’ve been checking out the quality of stuff, and I’ve pulled one of my designs that printed poorly. If you buy anything, and it doesn’t look like you expect from the photos, be sure to return it for a refund. Cafe Press has a full satisfaction guarantee. If nothing gets returned, I will never know if a design isn’t working, or if there’s any problem with the process. Proceeds help pay for bandwidth to keep this site (and others) online. Thanks for your support! 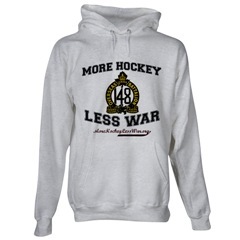 This entry was posted on Monday, February 12th, 2007 at 11:32 pm and is filed under Hockey, Merchandise, War. You can follow any responses to this entry through the RSS 2.0 feed. Both comments and pings are currently closed.